Earwax leaves the ear naturally, but sometimes can create a blockage. Earwax, or cerumen, is produced in the ear canal to protect the ear from dust particles, microorganisms, and other foreign particles that could potentially damage your ear. Normally, earwax dries up and falls out of the ear on its own, but in some circumstances the earwax can buildup and create a blockage in the ear. Some people are more inclined to have earwax buildup due to the shape of their ears making it difficult for the earwax to to be removed naturally. When the wax in your ear gets pushed too deep into the ear canal it can cause an impaction. However, you may be surprised to learn that most impactions are caused at home. Use of a cotton swab, bobby pin, or other foreign object to clean the ear may remove some of the surface wax, but can also push deeper wax in and create a blockage. Never stick any foreign objects in your ear! Furthermore, frequent use of earphones, earplug, or hearing aid can also leave you more susceptible to impaction by preventing the natural process of earwax removal. 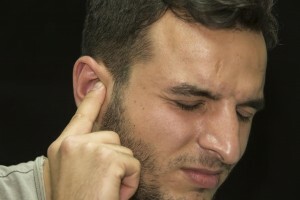 Some signs that you have an impaction in your ear include reduced hearing, dizziness, ear pain, tinnitus (ringing or buzzing in the ear), itchiness or drainage near the ear canal. Impactions in the ear can lead to other complications such as ear infections, perforated eardrums, or acoustic trauma. It’s essential that you see a doctor if you suspect you may have an impaction. Dealing with earwax buildup can be frustrating, especially for those individuals whose ears are more prone to buildup. Still, it’s important to remember that you should never stick any object, including Q-tips, inside your ear canal. So what can you do? You can try to prevent buildup at home by using over-the-counter earwax softening droplets. Place the droplets into your affected ear and hold your head to the side for about five minutes. The droplets will soften the wax and allow it fall out more easily. Afterward, you can also attempt to flush out excess earwax taking a shower or using a bulb-type syringe full of warm water. However, if you believe build-up has occurred you should always get help from your doctor. A doctor can irrigate the ear canal and safely remove wax with a curette. A once a year cleaning should be enough to keep impaction at bay. Clarity Audiology & Hearing Solutions is an independently-owned and operated clinic that focuses on quality of care and personalized, friendly service. Our Doctors of Audiology are highly trained with advanced degrees and take the time to provide the personalized care and attention that you need and deserve. We provide advanced hearing aid options that personally calibrated with cutting-edge digital technology to fit your hearing loss, your unique ear anatomy, and your individual listening needs. This entry was posted on Friday, June 17th, 2016 at 1:32 pm. Both comments and pings are currently closed.